In 1959, a working-class government employee in the tiny desert town of Lone Pine, California, asked world-famous modern architect Richard Neutra to design his modest family home. To his surprise, Neutra agreed. Thus began an unlikely friendship that would last until Neutra’s death in 1970. The Oyler House: Richard Neutra’s Desert Retreat tells the story of this house and its stunning desert setting through interviews with Richard Oyler, actress Kelly Lynch, who currently owns the house along with her husband, screenwriter Mitch Glaser, Neutra’s two sons, and well-known LA real estate agent Crosby Doe. I just watched a screening of this film almost by accident. I know Kelly and Mitch through the man that changed my life most (except my father) Michael O’Donoghue. Michael was the brilliant comedy writer that was first headwriter on Saturday Night Live, nearly 40 years ago. Mitch was Michael’s writing partner and best friend. Michael started the paint by number collection that I know own and use and the source for my paintings. He passed away twenty years ago in ’94. Just two years earlier, I was at Mitch and Kelly’s fun wedding in LA. I knew they owned a Neutra house in the dessert (but not the name) as I had seen photos of it in Italian Vogue by Bruce Weber that had always stuck with me. I signed up to see this screening at SoHo House without reading the description fully, just knowing it was about Neutra. Another old pal, Ann Magnuson has a sweet little Neutra House in Silverlake that I just photographed along with Mitch and Kelly’s stunning Lautner House (and Wow’s Fenton Bailey and Randy Barbato’s fantastic LA digs) when I was there last fall. Anyway, this documentary and this house and its story are VERY movingly told, like some mystery that I had clues to all along. 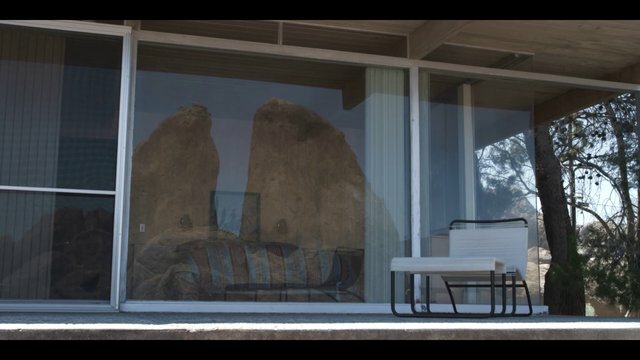 As you can see from the photos, it’s uniquely beautiful location and an early example of a modest Neutra house that is truly magical, due in great part to the rock formations Oyler’s kids called “the two big toes” which are sighted perfectly – cinematically, really. I fell in love with it, Oyler and frankly my friend Kelly’s kindness, intelligence and sensitivity, that I’ve experienced and miss. I hope to visit one day and report back. See this film if you love modern architecture – and a good mystery with a happy ending.